Young Azerbaijani violinist Nigar Mirzayeva has won a two-year scholarship to attend the prestigious Yehudi Menuhin School in Surrey, England. The 13-year-old completed the sixth grade at Baku's Bulbul School this past spring and is enrolled in the Menuhin School for gifted young musicians this September. Left: Thirteen-year-old violinist Nigar Mirzayeva recently received a two-year scholarship to study music at the Yehudi Menuhin School in London. Nigar [pronounced nee-GAHR] says that her parents, especially her mother, have been instrumental in developing her musical career. "I started playing the violin when I was seven," she says. "At the time, my older sister Gunel was learning to play the piano, and my mother wanted me to have a musical education as well. I really liked the violin, so we decided that I should try to learn to play that." In 2000, Nigar had the privilege of taking Master Classes from world-renowned cellist Mstislav Rostropovich during his visit to Baku. She has also taken Master Classes from Dmitry Sitkovetsky, the son of pianist Bella Davidovich. Nigar has already performed with the prestigious Azerbaijan State Orchestra on seven occasions and given four concerts on her own. "Music is my future," Nigar says. "I can't imagine my life without it. During the school year, I practice at least five hours a day. And during the summer, it's even more. Some people say that they rest for a week after a concert and do nothing, but my mother would never let me do that. The day after a concert, I have to go back to practicing. "Playing the violin requires a lot of strength. You also need to have a good ear and almost perfect pitch. Not everybody can practice the violin a lot and study hard. If you don't have a tremendous love for music, nothing will come out of it." In her free time, Nigar likes to listen to classical music and watch ballets and operas on videotape with her family. "My father buys old Soviet ballet and opera videotapes for us," she says. "We enjoy watching the ballerinas, musicians and laureates of international competitions." Nigar says she is looking forward to the experience of attending the Menuhin school. "I think the school is going to be very exciting. It has 58 very strong students gathered together, all studying, living and practicing in the same place. Plus, going to school there will make it much easier for me to participate in international competitions." Nigar, obviously, is an extremely talented young violinist, but it was the joint efforts of several people who appreciated her talent that made this dream possible. Back in November 2001, Nigar's performance during the Bulbul School's concert at the International School of Azerbaijan caught the eye of Linda Lawrence, the wife of BP's then head of Media and Public Relations in Baku. 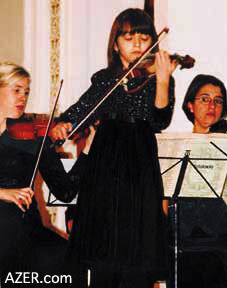 Lawrence, who now lives in Hong Kong, arranged to have Nigar flown to London in April 2002 to audition and take entrance exams at the Menuhin school. There she performed Mozart's Violin Concerto No. 3, Veniavsky's "Scherzo-Tarantella" and Paganini's Capriccio No. 5. By July, the school had offered her a full music scholarship. Although the school was waiving her tuition, Nigar still had other expenses that had to be covered. That's when the Anglo-American Society (AAS) in London stepped in to pay for her deposit, strings, music and plane tickets to London. British Airways contributed a round-trip plane ticket as well. Margaret Morris, Executive Secretary of the Anglo-American Society did much of the legwork to coordinate the decision within the Society to sponsor Nigar and help pay her fees. Also important to the effort was Susan Crouch, Managing Director of Spearhead Exhibitions, the organizer of the Caspian Oil and Gas Exhibition in Baku for the past nine years and a Board Member of AAS. Azerbaijan International's staff in Los Angeles and Baku helped to facilitate contact and language translation with Nigar's family so that all deadlines could be met for the fall term. Listen to Nigar play the violin at AZER.com, click MUSIC, then Nigar Mirzayeva.